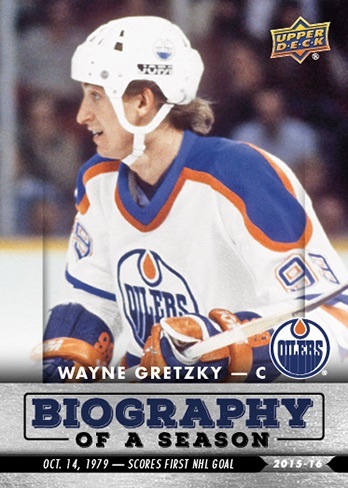 "The Great One" and the next great one receive complete coverage in 2015-16 Upper Deck Biography of a Season Hockey. 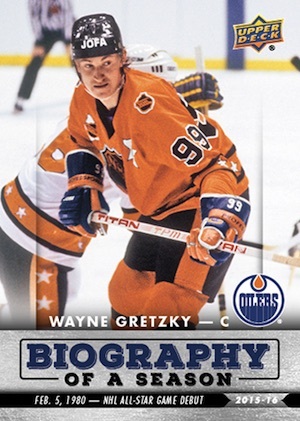 The promotional set from Upper Deck commemorates the debut seasons for both Wayne Gretzky and Connor McDavid and is available exclusively through select online retailers. Split into two releases, the first series includes six cards for each player that documents notable events from the start of their career. 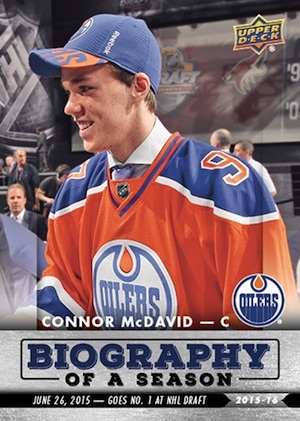 This includes McDavid going first overall on June 26, 2015 and Gretzky scoring his first NHL goal on October 14, 1979. The second series will come later in the year and will feature the progression for both players during their rookie years. 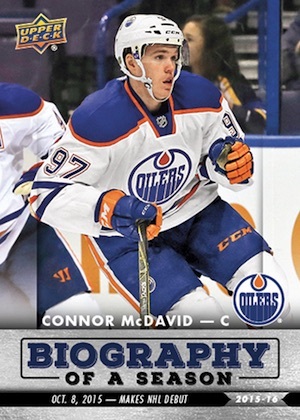 Given Wayne Gretzky's legendary status and Connor McDavid's huge potential for greatness, the two elite hockey players have already been regularly compared and that will only increase now that McDavid is playing in the NHL. The full checklist for the first series can be seen below. Collectors can obtain the limited promo cards by purchasing 2015-16 Upper Deck NHL Hockey boxes through Upper Deck's network of Authorized Internet Retailers starting in the middle of November. (1) 1982 OPC Wayne Gretzky #106 PSA 8 NM-MT!!! Wayne Gretzky early autograph on crap card. Obtained in person. (4) - SEALED 2015-16 UPPER DECK SERIES 1 BLASTER BOX LOT - 8 YOUNG GUNS!!! 2015-16 UPPER DECK SERIES 1 (12) RETAIL HALF BOX PACKS - 1 SIDE - 3 YOUNG GUNS! !